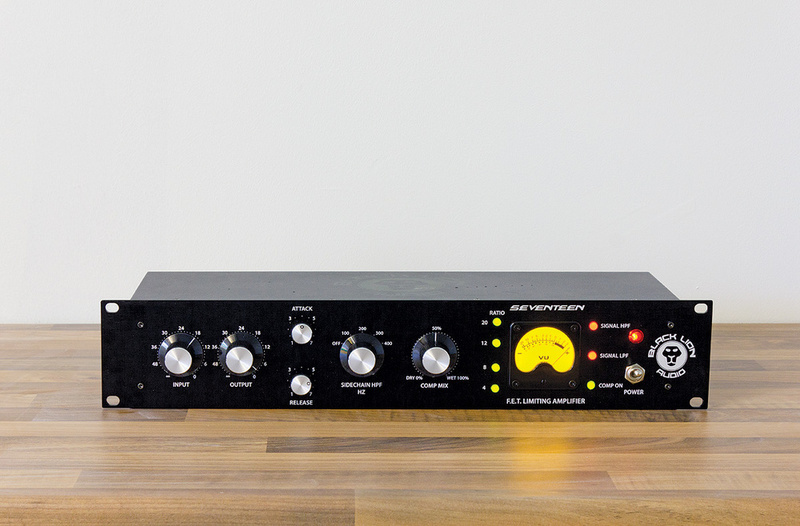 We put BLA’s feature‑rich and keenly priced 1176‑style compressor to the test. Black Lion Audio’s Seventeen clearly draws heavily on the classic 1176 FET compressor, but it’s not a straight clone. As with several FET devices we’ve reviewed in recent years, it builds upon that design, adding features that should be popular in modern studios, and taking advantage of modern devices to keep the noise floor low. BLA have managed to deliver all this at an asking price that’s within reach of mere mortals, without any obvious sacrifice in the audio quality and both ergonomic and aesthetic appeal. The review model was tidily packaged, and I was instantly enamoured by its classy appearance which, in keeping with the unit itself, is somehwat retro but with a modern twist. The solid construction and smooth‑yet‑sturdy feel of the controls and switches also inspired confidence. It’s a 2U 19‑inch rackmount device, but it ships with screw‑on metal‑and‑rubber feet, which allows more secure positioning on a desktop when not racked. On flipping the front‑panel power switch the Seventeen springs into illuminated life, but it’s far from a gaudy light show. The large, moving‑coil VU/GR meter is backlit in amber, the retro jewel light to indicate power‑on glows a dim red, and the seven buttons arranged either side of the meter light up in one of two colours — the four ratio buttons and Comp On (bypass) are green when engaged, while the signal LPF and HPF buttons are red; all are unlit when not engaged. These flat‑topped buttons are made of a smooth, translucent plastic and thus emit a very even light. Clear and bright but not dazzling. It’s all very tasteful. The input and output level controls, with UREI‑style skirted knobs, are detented 41‑position pots which make recall and comparison easy. The attack and release are similar but with 11 steps apiece — more than enough for these functions. There appear to be four ratios to choose from, but as with the 1176 there are more, as you can engage multiple ratios simultaneously. One more modern feature is the rotary five‑position side‑chain filter switch (100, 200, 300 and 400 Hz, and Off). Engaging this filter makes the compressor less sensitive to lower frequencies and thus, relatively, more responsive to what’s going on in the mid‑range and highs. For example, you could deploy the compressor on a drum bus and use the filter to make it less prone to pumping in time with the kick. More unusual are the switchable first‑order (6dB per octave) high‑pass and low‑pass filters in the signal path. With turnover frequencies at 10kHz and 100Hz, the idea is presumably that this allows you to attenuate some of the low‑level detritus such as rumble and hiss, which would otherwise be raised in level when applying make‑up gain, or compensate for the changes in tonality that result from more aggressive compression. There’s instant parallel compression on hand, too, courtesy of the 41‑position wet/dry mix control. When this is set to the fully clockwise position you hear only the compressed signal, and turning anticlockwise gradually introduces more of the unprocessed source; at fully anticlockwise, all you hear is the unprocessed signal. Step 21 (the 12 o’clock, position) is an equal mix of the two signals, but due to the passive nature of the summing the overall sound is about 3dB louder here than when the knob’s at either extreme. It’s not a big issue by any means, and to adopt a ‘pan law’ approach to keep the sound level and at the same time avoid affecting the sound would have required an active stage and greater expense — but it’s worth being aware that you might find yourself wanting to use the output level control to compensate for this at times. The manual (if the 4.5‑side user guide can be called that) explains that the front‑panel controls govern relays in the signal path, though we’re not told which controls do so. A rear‑panel RCA phono socket allows two units to be linked for stereo operation. I didn’t have two units to test this, but I assume it works by summing the two compressors’ control signals. One thing that might have been nice, given that this is a rackmount device, would have been to include a front‑panel control to allow the user to choose between linked and unlinked operation, and possibly another to determine the balance between the two units’ control signals. 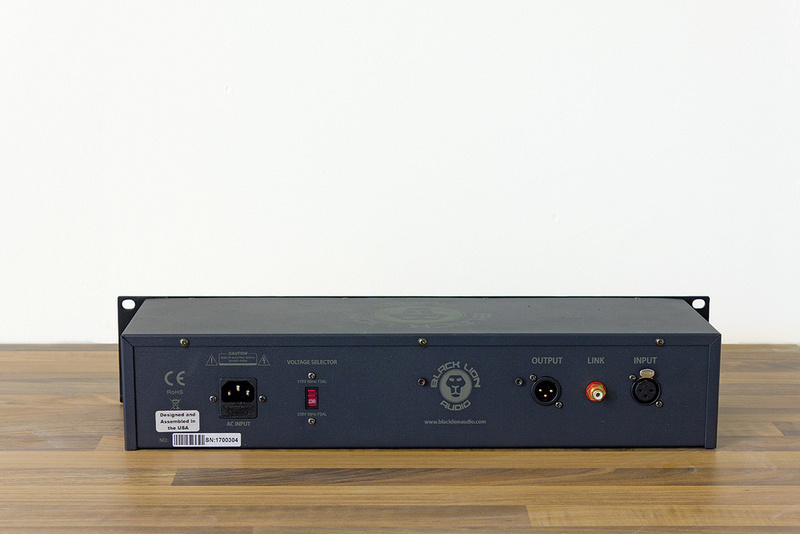 This phono socket is joined by balanced analogue I/O on XLRs, an IEC power inlet, a switch to set this to accept 60Hz 110V or 50Hz 230V AC mains power, and a label that proudly proclaims this device to have been “designed and assembled in the USA”. The RCA phono connector allows you to combine the control voltage of two Seventeens for stereo operation. There was a pleasant, subtle thickening effect at the bottom end, which I assume was down to the presence of transformers in the signal path. But elsewhere, it sounded nice and clean, with a subjectively open and airy top end; the unit itself contributed no audible noise in normal operation. All in all then, I have no hesitation in saying that if you’re seeking 1176‑style compression at a knock‑down price, then this package is well worth consideration. It’s a stylish device that not only sounds good but offers a useful combination of facilities. It also comes with a three‑year warranty, which inspires confidence, and while it’s not without serious competition, even at this keen asking price, it is definitely one to put on the shortlist. There are plenty of 1176‑derived designs on the market, but here are a few you might consider. The Klark Teknik 1176‑KT is the most keenly priced of all (the street price is ridiculously low!) but, like the Warm Audio WA‑76, it lacks features such as side‑chain filtering and parallel compression. The Lindell Audio 17x, which offered almost all the facilities of the Seventeen is sadly now discontinued. The Wes Audio Beta‑76 is more expensive and again lacks some functions, but stereo linking is switchable from the front panel. There are also plentiful options in the 500‑series format. Well built, sounds good and looks great. Does the 1176 thing and adds useful bells and whistles too. Keenly priced, considering what’s on offer. The manual could be more comprehensive. Black Lion have delivered a striking‑looking, great‑sounding take on the 1176, which offers some useful additional facilities — and for a good price too. SCV Distribution +44 (0)3301 222 500.